After last year’s tales of a family with a streak of cannibalism, the uncharitable charity and a butterfly with a very dark streak along with some wonderful monologues from our Brief Glimpse young writers and directors – less is MORE is ecstatic to be once again facilitating new writing as part of their ongoing commitment to Middlesbrough Theatre, Teesside and the North East. Merging local theatre practitioners and celebrating what the North East does best, different companies, actors and directors will bring to life new plays and realise the written word from page to stage! 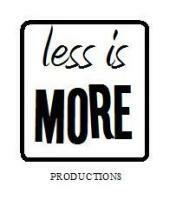 less is MORE Productions is dedicated in making opportunities for young performers in the North East with a priority commitment to help develop original theatre artists from our area. Working to create both new undiscovered work as well as their own unique takes on previously performed work. Mike lives in the last house in Grove Hill with his wife Joy. He still shops at the market, when he can, in his battered old car to buy fresh Whitby fish every Tuesday. He paints his side of the fence every spring and autumn. Next door lives a young family Nikki and Sam. A very modern family unit who sit outside in pyjamas, eat take away most nights and can't understand why someone would care for their wheelie bin. Nikki's sister Jan is helping them out as today they are packing, another family leaving. For both families this was their family home, this is where they started their journey and this is where it will all end. A woodland, used frequently by best mates Titch & Tommo as an escape from their troublesome home life, is fenced off for a new executive housing development. The wood is a place of childhood memories, where friendships and family bonds were forged and broken. Tommo & Titch are forced to face their worst fears, when the only place left for them to go, is home. Lola loves it on the rooftop. She has a birds-eye view of her beautiful, beloved Teesside with a minds-eye view of her future. Minute by minute Lolaâ€™s once secret place is losing itâ€™s safety as the concrete paving and felt lining is pulled from under her feet. Summer Solstice, constellations, revelations, 11p.m, Middlesbrough and five ordinary working class lives that will never be the same again. Can a place ever really be safe? From the first morning newspaper a group of writers and actors will go through from the front page headlines to the sports pages and find a story of interest to them. Then the group will split in to an actor and writer and spend the day creating a monologue based on the article they have read using the headline as the title of their monologue. By the time the audience arrive there will be a whole evening of monologues for them to see and discuss with the creators.